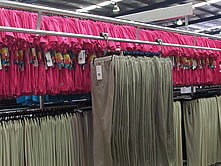 Appcon Railing Systems have the ability to handle and process hung garments quickly and efficiently. The railing systems consists of two galvanised steel tube sections welded to form a rigid truss section. 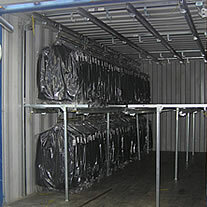 The trolleys (skids) with the required hung garments loaded, are traversed along the railing and through the warehousing system to the required area. The trolleys (skids) are switched from one line to another via a hand operated spring loaded tubular switch section. 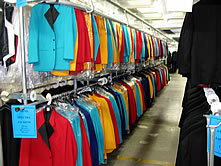 The garments can be removed from the trolleys and stored on adjustable racking until required to be picked up for dispatch. 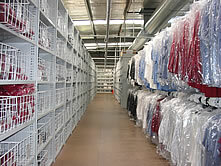 All Appcon systems are specifically designed to meet your individual garment handling requirements. Appcon offers a obligation free design and consultation service. With demand for clothing increasing, high quantities of apparel must be handled and stored efficiently to gain the greatest commercial advantage. Appcon Engineering can assist your company by providing a total system package that is productive as well as labour saving. 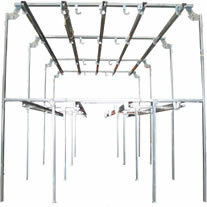 At Appcon, we design, manufacture, install and service apparel handling systems. We also offer advice and solutions for warehouse storage and distribution problems. Appcon Engineering shipping container railing systems are designed to easily fit into a shipping container with no tools required. The system simply clips together with incorporated locking pins. Two men can assemble this system in under five minutes. 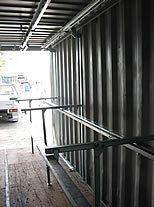 Once erected inside the container, the system is coupled to the warehouse railing system via a standard bridging section. The loaded trolleys are pushed into the container ready for transport. On arrival at the unloading point, the system is coupled to the warehouse railing system again via a bridging section and the trolleys are simply rolled out onto the local distribution warehouse system. 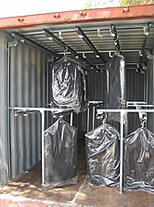 Once the container system is empty, the system is quickly dismantled and stored. The container is then returned to the container depot and the dismantled systems are ready for transport to the manufacturer for the next shipment. These systems deliver the garments from the international manufacturing premises to the local distribution warehouse in pristine condition removing the costly need for repressing and reprocessing of the garments. The Appcon container rail systems are fully modular so they can be easily moved from one container to another without the need for assembly tools.